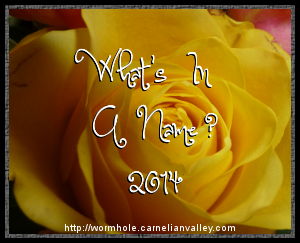 Time to sign up for next year’s What’s in a Name Challenge, hosted by The Worm Hole! Categories and examples are taken verbatim from the host’s web page. I have really enjoyed this challenge in the past, and I’m looking forward to finding titles for each one of these categories! Click here for more information and to sign up. Hope you enjoy the challenge this year!